In early November I had the pleasure of traveling in Italy for twelve days. Having never before been to the land of the Tuscan sun, suffice to say I had high expectations and some distinct ideas of what I thought my Italian Experience would encompass. I was especially looking forward to trying the food and the wine. Who doesn’t like Italian food, and Italian wine? Nobody, that’s who. Being a self-styled sandwich expert, I figured I could also contribute to the blog while traveling, in a win-win fashion. Italy had so much to offer me as a newbie traveler: ancient sites dripping with history, museums filled with masterpieces, beautiful architecture, an endless fashion parade full of beautiful people. Every day was a new adventure, and the food was indeed wonderful, and the wine was just plain crazeballs. Unfortunately, regarding the sandwiches, I ran into something I have dubbed the “Panini Paradox”. It goes like this. Italians love to eat. A lot. They want you to order course after course and look at you quizzically when you attempt to just stick with one or two items, or perhaps (gasp) share an entree. If you don’t finish every morsel, they literally come over and ask if you don’t like their cooking, staring at you with their hurt, huge kitten eyes. Most of the food in the regions I went to was locally sourced, lovingly prepared, and completely delicious. With the notable exception of one thing, which I’m sure you have guessed by now, the damned sandwiches. The PP is particularly frustrating when you’re visiting a region renowned for its perfect ingredients, Tuscany, for example. You could just imagine a bit of fresh buffalo mozzarella, a locally grown ripe tomato, and a small amount of pesto on a fresh baguette. What you will get, however, is a tiny, stale roll with a bit of over-the-hill prosciutto and (gag) butter. 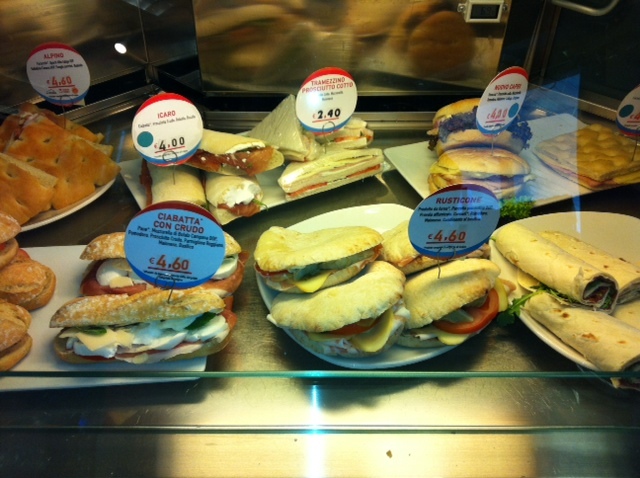 Indeed, these evil little sandwiches appeared in every espresso shop, Auto Stop, train station and even the finer cafes. They are a blight and a menace. Where were the good sandwiches? You will have to go there and let me know, because believe me, I tried to find them. I did visit one wonderful place in Siena where the sandwiches were all thoughtful varieties of meats and cheese toasted to perfection on pretzel bread and served on super-cute individual bread boards. 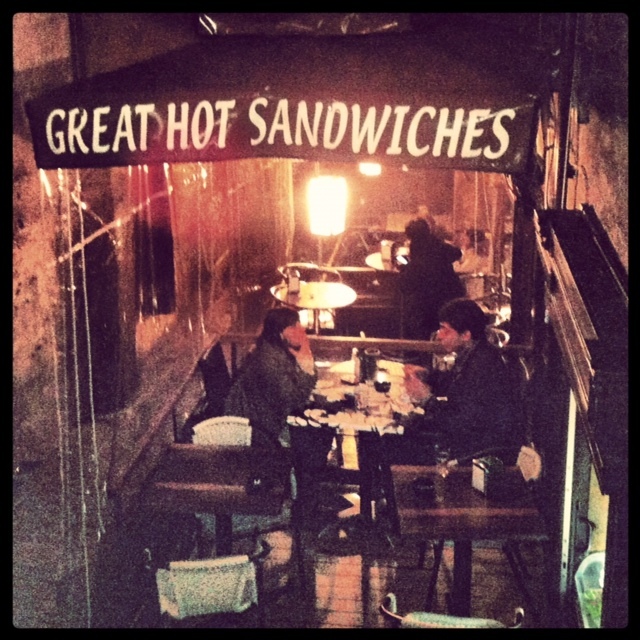 This was the one and only good sandwich during my entire visit. I heard rumors of others. A local foodie pointed me to the tripe sandwich at the Farmer’s Market in Florence. He told us it was not to be missed. We were there the wrong day and missed it. Cafes and restaurants promised beautiful plates, but offered lame cold cuts on (every single time) stale bread. This was the land that invented meats and cheeses of the traditional Italian deli. 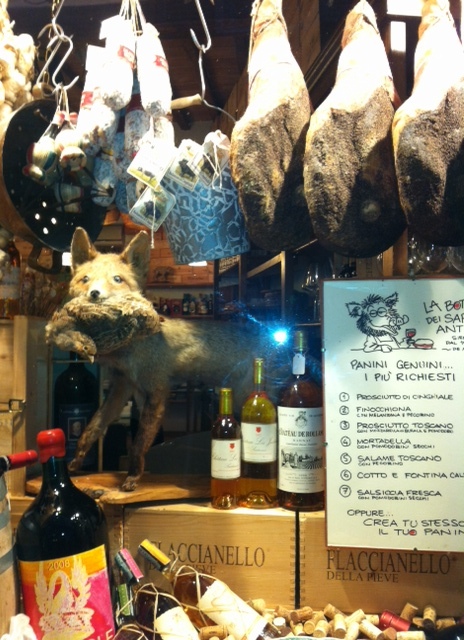 We even went to Bologna! What gives? In conclusion, Italy is fantastico. Go for the art, the culture, the wine, and the beauty. Just don’t go for the sandwiches. Or better yet, go there and open the best deli ever, you’ll have all the ingredients close at hand, making my next visit complete.